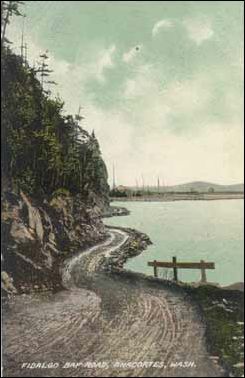 This post card, circa 1900, shows the initial wagon road that William Allard originally cut out from the bluff along the western shore of Fidalgo Bay, beside the Weaverling Spit. Courtesy of Claudia Lowman. This multi-part section will give you brief capsulized reports that may be expanded into full stories in the future. It was set up as a collection of end notes to our feature on Anacortes Amos Bowman's story of Eleven Years Hence, 1879 and 1890. You will find a click link in each capsule that will lead you back to the place in the story where you were reading. This section will be expanded in future issues. The capsules are alphabetized, using the first letter of the person's last name or the first letter of the business, building or place name. In this section: Edward L. Shannon . . . Elijah S. "Skookum" Smith . . . Gen. John W. Sprague . . . M.V.B. Stacy . . . Gen. Hazard Stevens . . . B.B. Tuttle . . . Weaverling Bluff and Weaverling Spit . . . Whitney & California Geological Survey . . .
Introduction to Amos Bowman: Before and After — the Anacortes founder publishes an 1879 letter predicting the boom and follows up with an 1890 article answering his own predictions. Includes brief profile and timeline for Amos and his wife, Annie (Curtis), namesake of the town and extensive endnotes. See the Anacortes/Fidalgo Island/Deception Pass Portal Page with links to other stories about that region and its people, and the story of how the Seattle & Northern Railroad fueled the boom. Edward L. Shannon Excerpted from the magazine, Anacortes Illustrated, Spring 1891, George P. Baldwin, Ed. . Strength of conviction which would withstand all discouragements could hardly be better exemplified than in the facts connected with the first pioneer on the north side of Fidalgo Island, Mr. E.L. Shannon. Mr. Shannon is a native of Vicksburg, Mississippi, and spent most of his youth at Milwaukee and later at Cincinnati, where he graduated at the celebrated Chickering Academy. He was then for a time connected with the large school book publisher, W. B. Smith & Co., of Cincinnati, and later held a position with the old Cincinnati Gazette. 1n the year 1863 he left alone, at the age of nineteen for California, going around by way of the Isthmus, and taking the old steamer Champion, the trip in those days costing a matter of $350. Arrived in California, he became engaged in the Mexican trade, which finally took him to Mexico, where he remained a year, returning to California to engage in insurance. 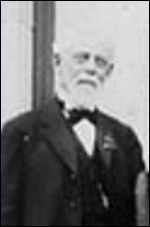 Mr. Shannon made his first trip to Portland in 1865 with General Hazard Stevens, who came up the Columbia as agent of the Oregon Steam Navigation Company at Wallula. Mr. Shannon's next trip was in-1870, when he located on Ship Harbor in the manner previously described in these columns [see below]. Of the i6o acres pre-empted by him, Mr. Shannon donated one-half as a subsidy on the entrance of the Oregon Improvement Company. Shortly after the failure of Jay Cooke and consequent abandonment for a time of the project to bring the Northern Pacific to a terminus at this point, Mr. Shannon engaged in other matters, and in the years 1879 and 1880 was connected with the Portland Oregonian. Mr. E. L. Shannon, a native of Vicksburg, Mississippi, and afterwards a resident of California, made a trip to Portland in 1865 to become agent of the Oregon, Steam Navigation Company, at Wallula. In the year 1870 Mr. Shannon came again from California, this time to the Sound, joining General Stevens at Olympia, where he was engaged as internal revenue collector for Washington, which he abandoned a year later to become attorney for the Northern Pacific Railroad. In the latter part of 1870 Mr. Shannon, acting in company with General Stevens, examined carefully the shores of Puget Sound and located at Ship Harbor, being followed by T. Henry Havekost, who located upon another portion of the water front, but subsequently moved down to Burrows Bay. In 1872 Stevens and Shannon formed a syndicate to secure all of the Burrows Bay and Ship Harbor property up to Bowman's Point and make a contract to sell out to Jay Cooke for the Northern Pacific terminus on the Sound. Stevens associated with him, for the purpose of taking up claims, Captain George D. Hill and B. B. Tuttle who were located by Shannon along the water front as far as the present Avenue P wharf, as well as the Burrows Bay frontage. Filings were not made until 1873, as the survey of the land was not commenced until the winter of 1872. Their negotiations with Jay Cooke were made through the medium of General J. W. Sprague, of Tacoma, and E. S. Smith (then known to some as Skookum Smith). By the failure of Jay Cooke their plans miscarried, although the negotiations were by him considered favorably and arrangements practically completed. In the interim have to note the advent of Orlando Graham and William Deutsch, who are still located on the present townsite of Anacortes. In 1880, [Shannon] entered the employ of the Northern Pacific Railroad as statistician and progress reporter in the building of the connection from Spokane Falls to Missoula, and was engaged thus for two years, making his reports direct to [Henry] Villard, [who took over control of NP]. After leaving the Northern Pacific, Mr. Shannon engaged in various pursuits on its line, which were very profitable; and among his investments were some which proved very judicious, not to say lucrative, namely those at Spokane Falls. Gen. John W. Sprague John W. Sprague was born in White Creek, Washington County, New York, on. April 4, 1817, and was a classic child prodigy as he entered Rensselaer Polytechnic Institute at Troy, New York, when just 13, but he left school before graduation and became a merchant as a teen. He moved to Ohio in 1845 and continued in business until the Civil War broke out, when he raised a militia and was commissioned as a captain of the 7th Ohio infantry. He rose rapidly through the officer ranks on the strength of his knowledge of logistics and organization and was brevetted as a major general before he mustered out of service in 1865. His post-war railroad career was assured on the strength of his dual accomplishment as a commander of a unit in Alabama in July 1864 that defeated an overwhelming enemy force and as an organizer who preserved a rail corridor for moving his corps into position near Decatur. He was posthumously awarded the Congressional Medal of Honor in 1894 for those actions. General Stevens was the son of the first governor of Washington Territory, Isaac I. Stevens. At age 13, he accompanied his father and assistants on an arduous 3,000-mile trip in 1853 from the East Coast to Olympia in Washington Territory. The governor was quite taken with Fidalgo Island in his terms here from 1853-57. Both father and son were U.S. Army officers in the Civil War. Hazard enlisted after leaving his first year of college at Harvard. On Sept. 1, 1862, both were wounded at the Battle of Chantilly, north of the Bull Run River and Manassas. Isaac, a major general in command of the 79th New York Highlanders, died of his wounds and Mark M. Boatner's The Civil War Dictionary notes that he was being considered at that point to be the next commander of the Army of the Potomac. Son Hazard was actually wounded twice, but recovered and fought in The Wilderness under Gen. Ulysses S. Grant, and went on to capture Fort Huger in Virginia in April 1863, action for which he was awarded the Congressional Medal of Honor for his bravery. He was brevetted to Brigadier General, thus becoming the youngest general in the U.S. Army. Theresa Trebon, in her book, First Views, notes that after the war, Hazard assumed the support of his mother and siblings and he and his sister Maude speculated in real estate on Fidalgo, losing heavily in the Financial Panic of 1873, but then investing more, and Amos Bowman bought part of the land. We also know from various biographies that the U.S. government in 1867 appointed Hazard Stevens to be Collector of Internal Revenue for Washington Territory of. After leaving his federal post he read for the law privately under the tutelage of future Secretary of State Elwood Evans and was admitted to the bar in Washington in 1870. He was soon hired as an attorney for Northern Pacific Railroad and later became the president of Olympia Light and Power Company and Olympia Railroad Union. An early mountain-climbing enthusiast, he accompanied Philemon Van Trump, the private secretary to the 11th Territorial Governor, Marshall F. Moore, in 1870 on the first successful ascent to the summit of Mount Rainer (see this Journal website). In the early 1870s he stumbled professionally. In 1871, the federal government decided to prosecute loggers who were poaching timber from federal lands along the NP checkerboard right-of-way across the Northwest and NP attorney Stevens was issued blank subpoenas to prosecute the thieves. By early 1873, however, the government received reports that Stevens was actually aiding timber poachers who were in league with him. According to an article on this Journal website, "The U.S. General Land Office finally stepped in June 1873, and accused Stevens of stealing from the government and the railroad. Stevens was not charged, but NP fired him." 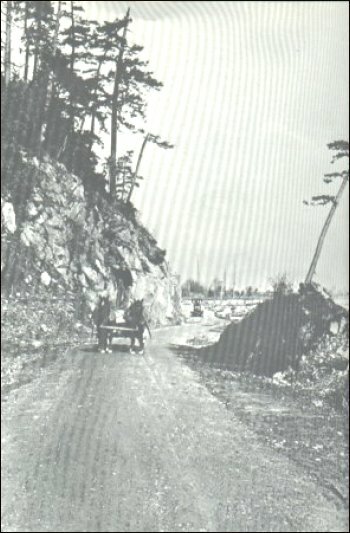 This is another view of the original wagon road near Weaverling Spit, taken in 1906, according to Dan Wollam in The Anacortes Story. Note the ghostly specter in the background of a very early automobile on the gravel-packed road. It could very likely be Nick Beezner in his battery-powered Cadillac, on of the first four horseless carriages in the county. Theresa Trebon explains in the book, First Views, that the bluff and spit were named for the James and Frances Weaverling family, who came to Fidalgo Island in the 1872. The spit, which extends on the perpendicular eastwards out into Fidalgo Bay, has been altered dramatically, including in 1920 when the sharp point was blown away with 75 tons of explosives. I checked the 1870 census from Johnson County, Missouri, where the family last lived before moving here in 1872. Frances was Weaverling's third wife; his first two wives died, in 1850 and in 1860. They had five children together and four children were by the first wives. Only five of the children were listed with them in the 1880 Ship Harbor Precinct census here and one of the older girls was married and living separately with her husband and two children. James was a native of Pennsylvania and Frances of Vermont. He lived with the first two wives in Illinois and married Frances there. They apparently moved to Missouri by 1868. James was listed as a farmer in 1880; Charles worked on the farm and the other four children attended school. Whitney & California Geological Survey One Foot on the Border and other sources claim that Professor Whitney hired Bowman for his famous geological survey in 1868 and that Amos remained in that employ for six years. This claim is apparently a repeat of some prior article for which the writer did not research the actual Whitney survey or records in the University of California-Berkeley library. First, signed records in that collection indicate that Bowman was engaged by the survey as early as 1865, so he had obviously returned from Europe by then and was hired by 1865 or before. Second, Whitney's actual involvement with the survey was cut short in 1868. Josiah Dwight Whitney (1819-1896), a brother of grammarian and lexicographer William Dwight Whitney, was contracted as the state geologist of California in 1860. In 1864, he and his party were the first recorded white persons to see the peak of the mountain that was later named Mount Whitney — the highest peak (14,494 ft) in the conterminous United States, in his honor. As with Hubert Howe Bancroft and his landmark book series, however, Whitney often did not do the field work and heavy lifting himself, but instead depended on earnest, young scholars and researchers and surveyors, and Bowman certainly exhibited all of those talents. Although Whitney is usually associated with the survey for the period 1860-1874, he was actually a professor of geology at Harvard University from 1865 on. We also discovered that the initial Whitney survey ended in 1868 when the state cut off funding. So we suspect that Bowman was actually engaged by other team leaders in the various follow-up surveys until 1874. John Muir delighted in telling a story of the occasion when in June of 1879 he was taking a horseback party, including Dr. Joseph Cook, a noted clergyman, up Clouds Rest. The conversation naturally turned to the origin of the scenic wonders spread out before them. Muir had expounded his theory of the part glaciers had played in molding the landscape, and Cook had countered with his view that the valley and its surroundings were not the product of any evolutionary growth, but came into being as they now are, "created out of the hand of God." He favored Whitney's theory, that the bottom of the valley had dropped out, because it fitted in with his own view of creation. The reverend gentleman, who was rather portly, had dismounted and was examining a piece of the glacier-polished granite pavement to which Muir had called his attention, when suddenly his iron-nailed shoes slipped on the glassy surface and he sat down on the solid rock with all his ponderous weight. He was rather dazed by the jolt. Muir rushed over to help him to his feet, but could not refrain from taking advantage of the situation by exclaiming, "Now, Doctor, you see the Good Lord has given you this most convincing proof of the mighty work the glaciers have wrought!" You can click the donation button to contribute to the upkeep of this site at a time when we may be forced to cut it back for lack of funds. You can also subscribe to our optional Subscribers-Paid Journal magazine online, which is about to enter its sixth year with exclusive stories, in-depth research and photos that are shared with our subscribers first. If you like what you read, thank you in advance for whatever support you can provide. Did you enjoy this story? Please consider subscribing to the optional Subscribers Edition. That is how we fund this grand project. Check out Sedro-Woolley First for links to all stories and reasons to shop here first or make this your destination on your visit or vacation. Are you looking to buy or sell a historic property, business or residence? We may be able to assist. Email us for details. Did you find what you were looking for? If not, please email us and tell us what you seek and we will put it on our list to research. The more details, the better. Tip: Put quotation marks around a specific name or item of two words or more, and then experiment with different combinations of the words without quote marks. Remember, we welcome correction and criticism. Please click on the email slot at the right to report any problems with these pages or to suggest ideas for future stories. This is a completely free site. We fund it by providing an online magazine for paid subscribers. If you are not already a subscriber and you would like to help support our considerable research costs, you can subscribe for just $20.00 per year. As a paid subscriber, you will receive eight yearly issues plus many rare treats between times, including scans of photos and documents that illustrate local history, before they are shared with anyone else. You can go here for Subscription details and you can read the preview edition to see examples of our in-depth research. You may also order gift subscriptions for friends, family or clients who are interested in local history or students or military people who are away from home. Or you can email us for more details. Do you have scanned photos to share? Or you can mail us copies. See addresses to the right.